Dominique Perrault, best known for designing the French National Library in Paris, and his team beat 10 other entries to design the new building for the Mariinsky Theater in the most important architectural event in Russia in 70 years. "A great opera should be an emblematic building that is visible in the city. The golden envelope is the symbol of all the great monuments of St Petersburg," Perrault told a news conference on Saturday at the Academy of Arts. Perrault's design will cover the new marble building, situated on the site of the current Palace of Culture in Honor of the First Five-Year Plan on Ulitsa Dekabristov, in a "veil" of glass containing gold-colored anodized aluminum strips. Fontanka.ru quoted Perrault as saying that he aimed not just to "present the theater as a beautiful instrument for the Mariinsky's troupe, but also to intertwine with the city's historical fabric." "We worked like a clothes designer, wrapping the building in a sort of veil," he was quoted as saying. News Web site Fontanka.ru quoted Mariinsky Theater Artistic Director Valery Gergiev as saying on Saturday that he was attracted to Perrault's design by the "idea of light." 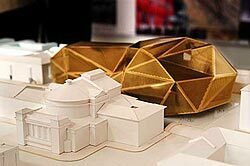 "The glass cupola above the building will let in a lot of light, conjuring up associations with the White Nights, a symbol of St. Petersburg," Gergiev said, adding that he hoped the new building would be ready in time for the Stars of the White Nights festival in 2008. However, jury member Colin Amery, director of the World Monuments Fund in Britain, voiced severe reservations about the winning design. "I think [Perrault] won the competition because of the golden dome, and its symbolism for St. Petersburg," he said in an interview Monday. "I think it's fair to say that there was a reservation about the practicality of that enormous glass structure in this climate. ... This was a major concern." Amery said that the jury put a caveat on its final statement that, while the "big idea" of Perrault's design appealed to the majority of the jury, there were concerns about its practicality, its maintenance and how much it would cost. "When he was asked how this very complicated structure would be cleaned, he said 'We'll have to use robots,'" Amery said of Perrault's final presentation to the jury. "[The design] is very experimental but, on the other hand, it's very fashionable." "The truth about Perrault's design is that it's a flashy umbrella with a very ordinary theater underneath," he said. "And it only has one, rather inadequate, link to the old Mariinsky, which is also experimental because its a telescopic bridge, which I can imagine won't work when it's frozen." "It doesn't solve quite a lot of the practical problems of linking the two theaters," he said. According to Amery, Perrault told the jury that, in winter, snow would just "slide off" the building, and that the golden dome would be visible year round. Culture Minister and jury member Mikhail Shvydkoi told Ekho Moskvy radio on Saturday that the 13-member jury had voted 10-2 in favor of Perrault's design. The missing, 13th member, according to Amery, was Gergiev, who was absent at the voting and whose deputy, Vyacheslav Lupachyov was not entitled to vote. "It seemed to be almost a foregone conclusion that Perrault would be the winner," Amery said. "[Lupachyov] came to the jury [in Gergiev's absence], and said that Gergiev wanted Perrault's design. ... He just liked it." Rumors before the announcement suggested that Gergiev was not really interested in the architectural merits of Perrault's design, but favored it as it provides the best concert hall in acoustic terms. Before Saturday's announcement, it was also suggested that Perrault's design was also the preferred choice of St. Petersburg's chief architect, Oleg Kharchenko. Lyudmila Likhachyov, Kharchenko's press secretary and the competition's secretary, did not return calls asking for comment on Monday. The head of City Hall's Committee for the Preservation of Historical Monuments, Nikita Yavein, who acted as a consultant to the competition, also refused to comment on the result, referring questions to the Culture Ministry in Moscow, where calls went unanswered on Monday. The new theater, which will be able to seat 2,000, will increase the space available to the Mariinsky by 39,000 square meters. Currently, the Mariinsky has only 40 percent of the space required by federal law for its 1,590 employees. The federal government has earmarked $100 million to build the new theater, but Amery said that Perrault's project could end up costing up twice this amount, as the architect's costings had been "modest," and that running costs had not been included. Culture Minister Shvydkoi said Saturday that "$100 million or $120 million" would be given to the project, Kommersant reported Monday. Amery said that he had voted for the design by Austrian architect Hans Hollein, who had "asked a very good question: Why do you need two identical theaters, based on the horseshoe plan?" Whereas most entries adhered to the basic plan for the interior of the theater drawn up by New York-based theater consultants Artec, Hollein proposed an alternative auditorium that Amery said was "more flexible." He said that there were a lot of things he disliked about all the designs - including Hollein's, which would have "needed a lot of architectural modifications" - and that "the general standard wasn't that high." While saying that the competition was, in general, well organized, Amery said that certain aspects left jury members scratching their heads. "The jury was not very happy that we had so little time with Mr. Gergiev," he said. "He only came to about 10 minutes each day" of the two-day jury deliberation. "I think that's in the Gergiev tradition," he said. "We were disappointed, because it's going to be such a major thing for the Mariinsky." Amery also said that, unlike most architectural competitions, jury members had no opportunity to visit buildings designed by the entrants, to see "how their existing buildings look and work." Whereas all the other entrants made one model of their proposal, Perrault "was for some reason allowed to make two models ... and the second model showed it in the context of the whole city," Amery said. "He rather sold it on the idea of the golden domes and golden spires of the city," he said, adding that Perrault seemed to have "allies on the jury." The current competition was announced on Jan.14, after an initial design solicited by Gergiev from California-based architect Eric Owen Moss caused uproar last year. The design, which envisaged copious use of Brazilian blue cobalt, was derided by local critics for failing to fit in with St. Petersburg's predominantly rococo architectural ensemble, and was nicknamed "the garbage bags." Amery said that, given the competition's history, he thought Moss ought not to have been invited to take part in the competition, and that the architect is now "very cross" about not winning, as he had expected. St. Petersburg analysts gave a cautious welcome to the result on Monday. Local architect Yevgeny Gerasimov said that the competition was a positive event for the city, but declined to comment on how he thought Perrault's design would fit into the city's architectural ensemble. He said that he would have chosen the design by Swiss architect Mario Botta as the winner, although he said Perrault's project was "fully worthy" of winning. "[Perrault's project] was one of the best designs," he said in a telephone interview on Monday. "The competition project is only an idea," he said. "The final result depends on how successfully it is carried out." Culture news archive for 01 July' 2003. Culture news archive for July' 2003.